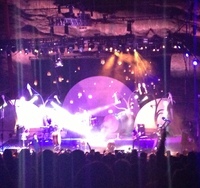 Complete with captivating backdrops, stage setup, and a few acrobatic stunts, Imagine Dragons did not fail to impress. Having yet another sold out show following their appearance at the Fillmore Auditorium just over a month before, the ego of front man Dan Reynolds was apparent, as he hung suspended in the air, doing acrobatics and banging on a bass drum, even with his recently broken wrist held up in a cast. The energy was cascading through the crowd as huge chart hits, such as “Radio Active” and “Demons”, were being sung along to with such vigor, the entire audience mouthing every word. If you have never experienced a performance at Red Rocks, you can not begin to imagine just how the music reverberates off the giant rock walls, or how it feels to see thousands of people blend into the night sky with the moon as a backdrop. Even the band members of Imagine Dragons were in awe as they looked into the crowd of waving arms and flashing neon lights.